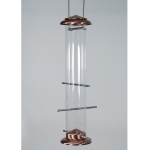 The attractive Mega Tube Feeder features copper color metal top, base and 6 ports. Comes fully assembled and ready to hand. Easy to fill and clean. Capacity: 7.5 lbs. Roof lifts off for easy cleaning and filling. Hang from any hook or hanger. Over 1 quart seed capacity (1.4 lbs). Roof lifts off for easy cleaning and filling. Large seed tray and 6 perches allow for many birds to feed at once. Holds 3.5 qts. of seed. 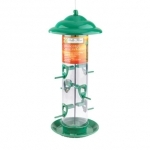 Attracts Songbirds such as Cardinals and Chickadees. For Sunflower Seed or Quality Mixes. Quality Plastic Feeders. Constructed of Durable Plastic Parts. Metal bail wire. Rigid clear polycarbonate tube. Threaded base fits DY Accessories. Just for the Fun of Bird Feeding! Great starter feeder or for children. Available in Sunflower and Nyjer seed models. 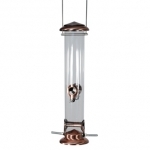 All Bird Lovers products are covered by a LIMITED WARRANTY on defects in workmanship and Materials. 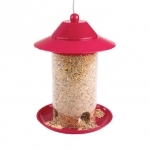 Feeds most common wild birds. Unique comfort perch invites birds to sit and dine longer. Easy to fill and clean. Large 1.75 lb. seed capacity. Base is removable for easy cleaning. Brushed copper finish on metal top and ports. Uses thistle/nyjer seed for finches. Four ports and 1.2 lb. capacity. 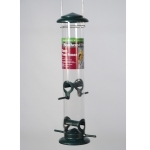 Specifically designed for finches and other thistle eating birds; easy to clean and fill; unique comfort perch invites birds to dine longer. Heavy-duty acrylic is indestructible by squirrels. Twelve feeding stations. 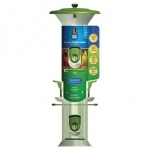 Easy to remove, threaded squirrel and weather guard simplifies filling. Built-in seed funnel and quick release seed tray. Extra large 10 lb. seed capacity. Thistle tube feeder attracts Goldfinches and many other kinds of birds. Bird feeder made from brushed Copper screen to hold thistle. 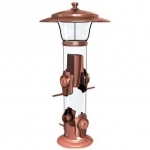 Bird feeder made from brushed Copper. Holds 2lbs of seed. Easy to clean and fill. Ready to hang. Attracts many kinds of birds.